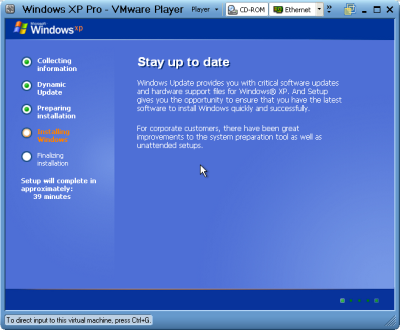 Today, after re-reading the "How-to: VMware Player modification" post on the Hack a Day site, I decided to give my creating a VM that works with the free VMware Player another chance. The instructions given below are based on a post made by Rhys. If you copy paste the above line into the command prompt (cmd.exe), do not include the prompt (the text before qemu-img.exe). If you do, you get the following error: 'C:\Program' is not recognized as an internal or external command, operable program or batch file. A file "WindowsXPPro.vmdk" with a maximum disk size of 2G (the actual file is much smaller; about 320 KB) has been created. You might want to move this file to a different folder. Note: when I created this file I had only 256 MB of memory, hence the low memsize (just 64 MB). 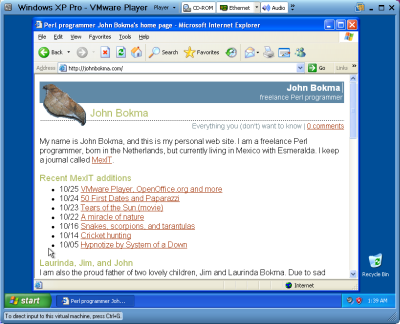 Edit: I have dedicated a small but growing section of my site to the VMware Player.